↑ Macdonald, David; Claudio Sillero-Zubiri (2004). The Biology and Conservation of Wild Canids. Oxford: Oxford University Press. पपृ॰ 45–46. आई॰ऍस॰बी॰ऍन॰ 0198515561. ↑ Freedman, Adam H.; Gronau, Ilan; Schweizer, Rena M.; Ortega-Del Vecchyo, Diego; Han, Eunjung; Silva, Pedro M.; Galaverni, Marco; Fan, Zhenxin; Marx, Peter; Lorente-Galdos, Belen; Beale, Holly; Ramirez, Oscar; Hormozdiari, Farhad; Alkan, Can; Vilà, Carles; Squire, Kevin; Geffen, Eli; Kusak, Josip; Boyko, Adam R.; Parker, Heidi G.; Lee, Clarence; Tadigotla, Vasisht; Siepel, Adam; Bustamante, Carlos D.; Harkins, Timothy T.; Nelson, Stanley F.; Ostrander, Elaine A.; Marques-Bonet, Tomas; Wayne, Robert K.; Novembre, John (16 January 2014). 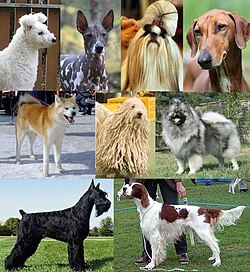 "Genome Sequencing Highlights Genes Under Selection and the Dynamic Early History of Dogs". PLOS Genetics. PLOS Org. 10 (1): e1004016. PMC 3894170. PMID 24453982. डीओआइ:10.1371/journal.pgen.1004016. अभिगमन तिथि November 7, 2014. ↑ Derr, Mark. "How Dog's Evolved Into "Our Best Friend"". NPR. अभिगमन तिथि 10 October 2013. ↑ Paton, Bernadette (2013). "The dog: man's best friend? (The use of mans best friend has usually been about dogs. They are hard working and reliable mammals)". www.oed.com. Oxford English Dictionary. अभिगमन तिथि July 5, 2013. ↑ Martin, Gary. "Man's Best Friend." The Phrase Finder. N.p., n.d. Web. 13 July 2013. <http://www.phrases.org.uk/meanings/mans-best-friend.html>. ↑ Van Winkle, C.S., ed. Vol. 4. New York: C.S. Van Winkle, 1821. 123. The New-York Literary Journal, and Belles-lettres Repository, Volume 4. University of Minnesota. Web. 13 July 2013. <http://books.google.com/books?id=raceAQAAMAAJ&pg=PA124&lpg=PA124&dq=faithful+dog>. ↑ Coren, Stanley (2009-10-21). ""A Man's Best Friend is his Dog": The Senator, the Dog, and the Trial". Psychology Today. अभिगमन तिथि 2010-09-27. ↑ Groves, Colin (1999). "The Advantages and Disadvantages of Being Domesticated". Perspectives in Human Biology. 4: 1–12. आइ॰एस॰एस॰एन॰ 1038-5762. ↑ अ आ इ Tacon, Paul; Pardoe, Colin (2002). "Dogs make us human". Nature Australia. 27 (4): 52–61. ↑ Ruusila, Vesa; Pesonen, Mauri (2004). "Interspecific cooperation in human (Homo sapiens) hunting: the benefits of a barking dog (Canis familiaris)" (PDF). Annales Zoologici Fennici. 41 (4): 545–9. ↑ "The University of Maine - UMaine News - UMaine Student Finds Oldest Known Domesticated Dog in Americas". Umaine.edu. 11 January 2011. अभिगमन तिथि 4 July 2013. ↑ अ आ Derr, Mark (1997). Dog's Best Friend. Chicago: University of Chicago Press. आई॰ऍस॰बी॰ऍन॰ 0-226-14280-9. ↑ Franklin, A (2006). "Be[a]ware of the Dog: a post-humanist approach to housing". Housing Theory and Society. 23 (3): 137–156. आइ॰एस॰एस॰एन॰ 1403-6096. डीओआइ:10.1080/14036090600813760. ↑ Katz, Jon (2003). The New Work of Dogs. New York: Villard Books. आई॰ऍस॰बी॰ऍन॰ 0-375-76055-5. ↑ Haraway, Donna (2003). The Companion Species manifesto: Dogs, People and Significant Otherness. Chicago: Prickly Paradigm Press. आई॰ऍस॰बी॰ऍन॰ 0-9717575-8-5. ↑ Power, Emma (2008). "Furry Families: Making a Human-Dog Family through Home". Social and Cultural Geography. 9 (5): 535–555. डीओआइ:10.1080/14649360802217790. ↑ Bradshaw, John; Blackwell, Emily J.; Casey, Rachel A. (2009). "Dominance in domestic dogs: useful construct or bad habit?". Journal of Veterinary Behavior. Elsevier. 4 (3): 135–144. डीओआइ:10.1016/j.jveb.2008.08.004. मूल (PDF) से 27 August 2010 को पुरालेखित. ↑ Tannen, Deborah (2004). "Talking the Dog: Framing Pets as Interactional Resources in Family Discourse". Research on Language and Social Interaction. 37 (4): 399–420. आइ॰एस॰एस॰एन॰ 1532-7973. डीओआइ:10.1207/s15327973rlsi3704_1. ↑ "U.S. Pet Ownership Statistics". अभिगमन तिथि 24 June 2010.